I love Christmas and all the baking and festivities that make the season so joyful. Every year I imagine all of the wonderful treats I’m going to whip up and regardless of the many baking books and clippings I already have stashed away, a new magazine of Christmas baking is always hard to resist. This year wasn’t any different as I carried home a new, 100 Best Desserts, Special Edition of Best-Loved Recipes from Taste of Home for 2012. The funny thing is, that after poring over every single page, the very first recipe I opted to make were these decadent Black Bottom Cupcakes that I actually discovered a couple of years ago and simply cannot resist. The first time I discovered them, I was looking for something that my youngest son could take to school. The idea of cupcakes that didn’t require icing was appealing, given that he and not me, would be transporting them. They turned out to be so easy and delicious that I’ve been making them for the holidays ever since. Chocolate and cream cheese are a delightful combination and these cupcakes are sure to fill any craving you may have during the holidays for a lush, moist, deep chocolate flavoured cupcake paired with a smooth, creamy cheesecake centre. The cupcake is made in two parts, first the creamy cheesecake centre followed by the chocolate cupcake batter. The liners are filled 1/3 full of chocolate batter followed by a generous dollop of cream cheese filling. Before adding the dollop of cream cheese filling, however, add a cup of mini chocolate chips to heighten the chocolate factor and add some extra dimension. Still warm from the oven, the little bits of chocolate are silky and smooth against the rich cream cheese and the moist, almost gooey chocolate cake. 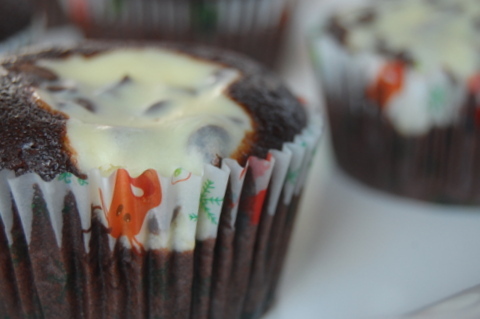 I baked these up in some holiday liners I had on hand to give them a festive touch of Christmas holiday cheer. During the holidays, I’ve also been known to add an extra dollop of cherry pie filling on top of the cream cheese before baking, so that they’re almost like a piece of black forest cake when they come out of the oven. Either way is equally delicious and always a hit with visitors and family alike. 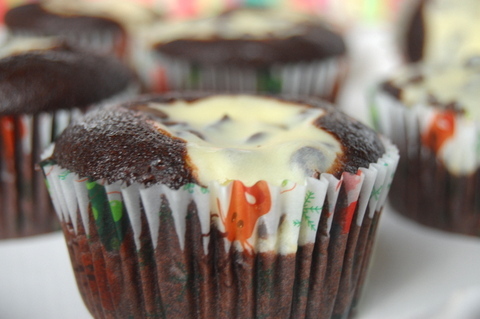 Served up with a cold glass of milk, a mug of hot cocoa or packaged up with a bright red ribbon for a friend, these tasty cupcakes are a nice addition to the holidays or pretty much any day of the year. 1. In a large bowl, beat the cream cheese, egg, sugar and salt until smooth. Stir in chocolate chips; set aside. 2. For batter, in a large bowl, combine the water, oil, vinegar and vanilla. Combine remaining ingredients; add to the liquid mixture and mix well (batter is on the thin side). 3. Fill liners 1/3 full with batter and top with a generous dollop of cream cheese filling. 4. 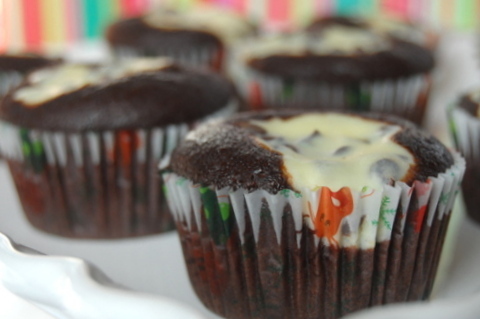 Bake at 350 degree F for 16-18 minutes or until a toothpick inserted into the cupcake portion comes out clean. Cool for 10 minutes before removing to wire racks to cool completely. Happy Saturday! This week ran completely away from me and the next thing I knew it was Thursday … and then Friday … and then … well today. I thought I’d better check in with you. You know, in case maybe you missed your weekly dose of flour and sugar. Never fear, I’m here with plenty of sweetness to go around. I just couldn’t keep all this loveliness to myself, so I’m here to share with you a little sweetness and some serious excitement. I’ve been finding it hard to focus on anything except these cupcakes. Aren’t they pretty. This week I was working on these cupcake samples for a client who is getting married in July. She has a vintage theme and wanted a buttercream swirl with a simple gumpaste flower on top. I made a variety of gumpaste flower colours so that she could choose which shade she wanted to use for her special day. As I was picturing the cupcakes, I couldn’t help but think how they were the perfect cupcake for Mother’s Day. Swirls of delicious frosting sitting on light vanilla cupcakes. Just a perfect marriage of cake, frosting and vanilla. Sometimes you just have to have plain old vanilla to appreciate just how good it is. Sometimes and I’m just saying, sometimes, it’s hard to find a cupcake that tastes as good as it looks when it’s just vanilla, vanilla. Sometimes they just look better than they actually taste. These cupcakes however, are different. You have my word, and I’ll even go so far as to say they taste … E.V.E.N. better than they look. How’s that for creating some excitment. Can I tell you a secret? Vanilla, vanilla cupcakes aren’t the only thing that’s got me excited these days. An opportunity to intern at the Bonnie Gordon College of Confectionary Arts has me excited. Over the moon actually. Bonnie Gordon is cake designer/teacher, extraordinaire and she started a college in Toronto in 2010 to share her wealth of knowledge and passion for meticulous cake design with others. Bonnie is a leader in the field of cake design education and she has a passion to nuture creative talent in her students. Ever since I started decorating cakes (which was just last year but it seems much longer somehow) I’ve wanted to go there. I’ve spent countless hours on the website, I’ve filled out the application to attend, at least 3 times, I attended their cake show in 2011 and I’ve even met Bonnie, but in the end, circumstances just never made it possible to actually take classes there. But all that is about to change because as of tomorrow, I will be there every Sunday for the next 4 months. My job will be to assist the instructors, help set up the classroom, assist the students and tidy up when we’re done. All the while, I will be listening to every little morsel of cake decorating genius from some of the best instructors in the country. I will be a sponge and just soak it all up. I couldn’t have asked for a more incredible Mother’s Day gift and in this recipe, I couldn’t have asked for a more delicious cupcake. This is seriously one of the best vanilla cupcake recipes I have made, and believe me, I’ve made plenty. The really fantastical thing about this recipe is that I came across it on the extraordinary baking blog by Rosie Alyea, called Sweetapolita. Rosie makes the most gorgeous, delicious and mouth-watering cakes and treats you’ve ever laid eyes on and believe it or not she learned and perfected a lot of her baking skills at Bonnie Gordon College. That’s all the proof I need to know that this is a going to be a good thing. No ones needs a holiday to send someone special wishes, but in honour of all you wonderful mothers I’m sending you buttercream wishes and sweet vanilla kisses for a wonderful Mother’s Day. 1. Preheat oven to 325 (170 degrees C) degrees F. Line standard cupcake pans with your favourite paper cupcake liners and set aside. 2. In the bowl of an electric mixer fitted with the paddle attachment, combine dry ingredients (flours, sugar, baking powder, and salt) and mix on low-speed until blended. Add cubes of butter, one at a time, and mix again until all of the butter is coated with flour. 3. Add eggs, one at a time, and blend until incorporated. 4. In a large glass measuring cup, whisk together milk and vanilla. With mixer on medium speed, add wet ingredients in 3 parts, scraping down the sides of the bowl with a spatula after each addition. Beat until just incorporated (it’s best not to overbeat). 5. Divide batter evenly among the liners filling about 2/3 full). Bake until a toothpick in the center comes out clean, about 17 -20 minutes (for me it was 17). 6. Remove from the oven and immediately transfer the cupcakes onto a cooling rack by inverting the tray. 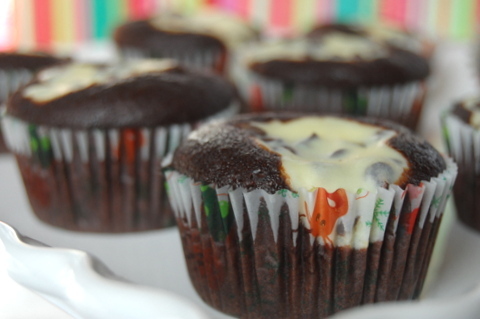 Carefully turn the cupcakes right-side-up and let cool completely before frosting. use a small offset spatula to frost tops of each cupcake or pipe on icing using a 12-inch Wilton piping bag fitted with a ……… tip. Decorate with flowers or sprinkles if desired. Serve at room temperature. They’re easy to make and the batter bakes up light and moist as long as they’re not over baked. I took mine out of the oven at 17 minutes. At 15 minutes, the toothpick came out covered in batter, at 17 minutes, they were done. So really keep an eye on them after 15 minutes. Mine were ready when they had just a touch of golden colour around the outside. 1 cup butter, room temperature, cut into pieces*. * I know all recipes call for unsalted butter here but I tend to use what I have on hand and more often than not, it’s salted, so to compensate, I leave out the salt in the recipe or add just the slightest pinch, if necessary. 1. Whisk the egg whites, sugar and (salt if adding) in a heat proof bowl set over a saucepan of salted water (do not let the bowl touch the water) until the mixture is warm and the sugar dissolves. Remove the bowl from the pan; let cool slightly. 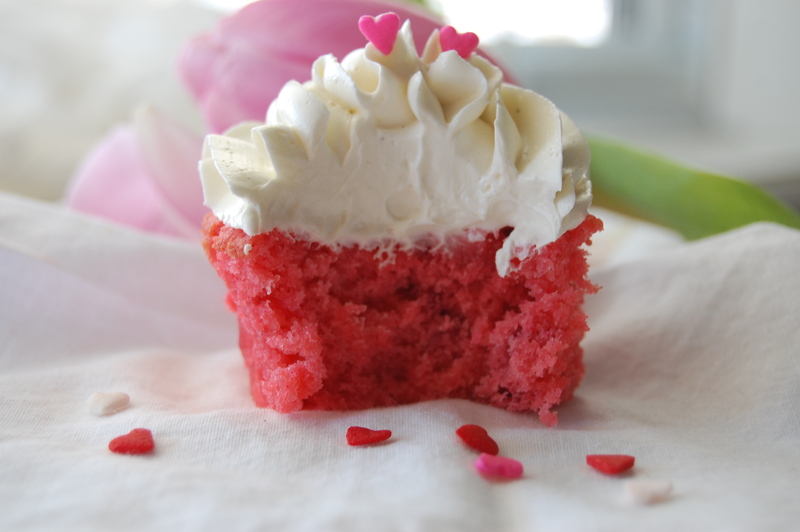 They say love is in the air, so what better way to say “I love you” than with a strawberry cupcake topped with whipped buttercream and candied hearts. some up for the sweethearts in your life. 1. 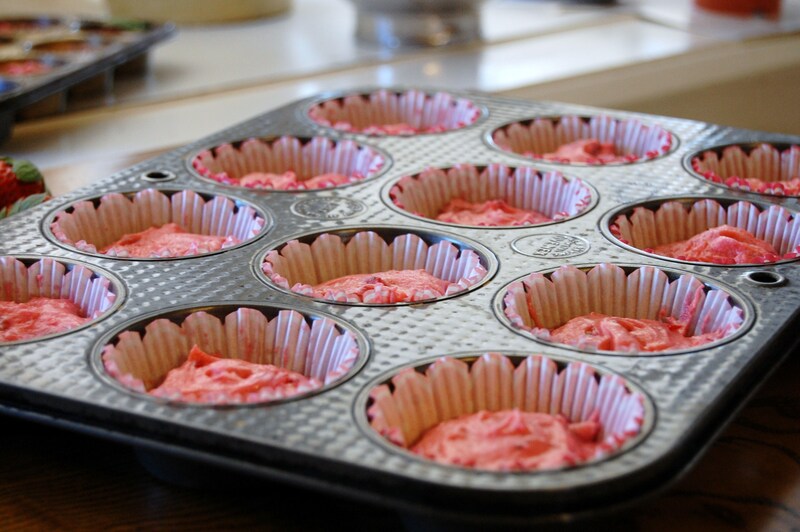 Preheat the oven to 350 ° F /175 ° C. Line one standard 12-cup cupcake pan with paper liners; set aside. 2. In the bowl of an electric mixer fitted with the paddle attachment, beat the butter and sugar until light and fluffy, 3 to 4 minutes, scraping down the sides of the bowl as needed. Beat in the egg and then the vanilla. With the mixer on low speed, add the flour mixture in three parts, alternating between the milk, beginning and ending with the flour mixture; beat until combined after each addition. Fold in the strawberries. At this point I added two drops of Americolor “Super Red” soft gel paste food colour to add a deeper strawberry colour. 3. Divide the batter evenly among the prepared cups so that each is about two-thirds full. Bake, rotating the pans halfway through, until the cupcakes are slightly golden around the edges and a cake tester inserted in the center comes out clean,about 20 minutes. Transfer pans to a wire rack to cool for 2 minutes. Remove cupcakes from the pan and cool completely on wire racks. 1. Pour egg whites and sugar into a grease-free and heatproof bowl. Place the bowl in a double boiler, with the water simmering, but not touching the bowl. Whisk the sugar and eggs continuously until it reaches 160 °F / 70 °C . This will take approximately 15 minutes. If you don’t have a thermometer, you can test the mixture by rubbing it between your fingers; if the sugar has dissolved, and the mixture is thick, it’s ready for the next step. 2. Remove the bowl from the heat and transfer to the bowl of an electric mixer. Whip using the whisk attachment until white, glossy, thick and cool. You can test the temperature by placing your hand on the outside of the bowl, if it’s comfortable and approximately room temperature, it’s ready for the butter. This step can take 10 – 15 minutes. 3. Start by switching to the paddle attachment on your mixer. Slowly add the butter in chunks, one at a time, until incorporated and your mixture is thick, smooth and silky. Don’t worry is your mixture looks soupy or curdles. It may appear to be ruined, but keep mixing and it will come together. If your buttercream appears to be too runny; place the bowl in the refrigerator for a few minutes and rewhip. If the buttercream appears to be to cold, set it back in the double boiler for a few seconds and whip again. Add the pure vanilla extract or scrape a vanilla bean, if you would like some tiny vanilla bean specs, and mix. If you would like to have a strawberry buttercream add 100 g (6-7) coarsely chopped fresh strawberries to the buttercream and whip for 1-2 minutes. (You can also add a drop of strawberry flavouring, though you won’t need it if your strawberries have a lot of flavour). Pipe vanilla buttercream using a Wilton tip # 2A tip in a pastry bag in swirls on the cooled cupcake topped with a couple of candy hearts, sprinkles, smarties or Hershey’s kisses. To pipe the strawberry buttercream you will need to use an open piping tip so that the strawberries won’t get stuck in the tip. Wilton # 12 Round or #199 Open Star should work just fine. 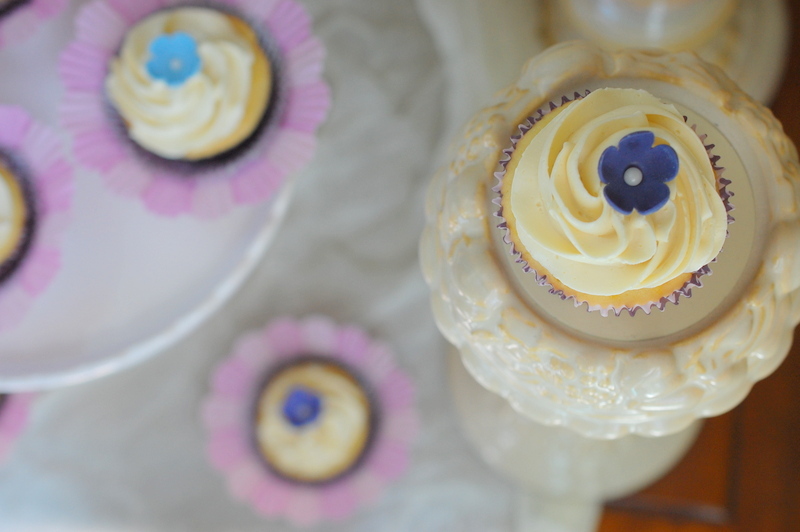 The buttercream should be used immediately or stored in an air-tight container in the refrigerator or freezer. Leave out at room temperature and rewhip with the paddle attachment of your mixer for 5 to 10 minutes when needed. Mmmm. Mmm. mmm. mm. Can’t you just taste that fresh berri ‘ ness?